The 2016 World Series of Poker (WSOP) resumed on July 13 at the Rio All-Suite Las Vegas Hotel and Casino with Day 2c of the $10,000 Main Event. The survivors of the third starting flight filled the tables at the Rio on Wednesday in poker’s most important tournament of the year. The day began with 3,252 players and play kicked off at 11 a.m. and continued for five two-hour levels before play paused for the night. At that time, just 1404 players still had chips to bag for Day 3 on Thursday. Counting out the largest stack of them all was Brazilian Gustavo Lopes with 630,700 chips. Only eight players finished the day with more than half a million, and Canadian Samuel Roussy-Majeau held the sixth-place stack with 545,500, making him the top Canadian when Day 3 sees the whole field combined for the first time. 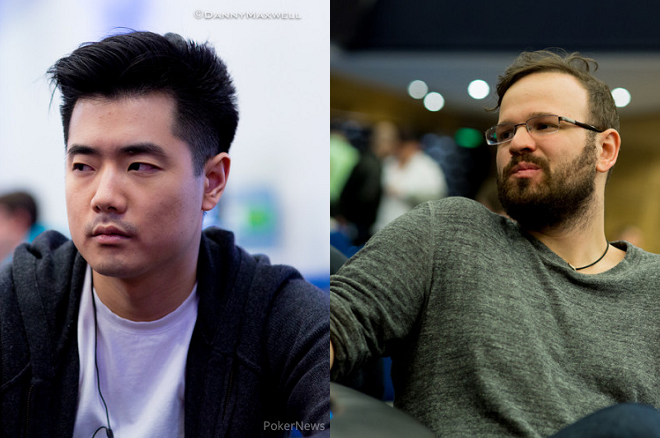 The second-best Canadian stack was that of James Boettcher with 468,300, followed by Andrew Chen (447,200). The rest of the Canadian contingent was made up of Griffin Benger (394,500), Kristen Bicknell (381,500), Sorel Mizzi (369,800), Noeung Troeung (365,500), David Cowling (356,300), Dominick French (353,300), Jordan Knackstedt (348,800), Yong Lu (339,900), Ratharam Sivagnanam (337,500), Alpheus Chan (316,300), Jean-Philippe Piquette (284,500), Michael Ho (280,400), Pavel Dyachenko (266,100), Noah Vaillancourt (235,300), Mike Smith (228,000), Ami Barer (223,300), Tyler Bonkowski (220,800), Jonas Mackoff (214,400), Homan Mohammadi (202,300), Danny Boyaci (195,500), Charles Rifici (184,900), Michael Gentili (181,700), Sam Greenwood (175,700), David Ottosen (174,100), Derek Gibb (172,200), Felix Morindutil (168,700), Andre Boyer (168,400), Anthony Diotte (160,000), Jair Beltran (159,500), David Ormsby (154,200), Jason James (140,200), Joshua Trott (131,600), Jeff Hakim (130,700), Adrian Kuan (125,500), Francois Gobeil (124,200), Jaroslaw Jaskiewicz (123,900), Max Greenwood (122,200), Timothy Adams (119,500), Dmitry Vitkind (118,000), Troy Nisbet (116,100), Michael Egan (108,600), Thomas Archer (105,000), Thomas Popov (103,800), Linyang Song (103,700), Elliot Smith (102,700), John Krpan (100,000), Alex Livingston (97,200), Rick Mask (95,800), Amy Fontaine (93,900), Ema Zajmovic (93,500), Omri Moga (92,100), Kevin Morris (92,000), Sebastian Sambor (90,500), Michael Adamo (89,400), Jason Bigelow (88,900), Brant Taylor (84,200), Robert Cheung (80,200), Todd Sisley (79,100), Jie Gao (77,400), Ryan Yu (77,300), Xiao Peng (72,300), Scott Hempel (71,100), Robert Laurie (67,400), Rene Siegrist (65,700), David Lim (61,500), Don Fujita (55,000), Dylan Collingwood (53,300), Steve Worr (50,800), Mark Dietrich (49,300), Chris Back (43,900), Arman Soltani (42,900), Robert Johnson (39,900), Edward Hislop (33,400), Rodney Burgermeister (32,900), David Bokor (31,500), Anh Van Nguyen (27,400), Anthony Mar (26,800), Aaron Duczak (26,700), Sam Chartier (24,000), Michael Noor (20,800), and Christopher Khalife (13,500). The top 1,011 players will earn a payout, so there is still a fair bit of play before players are in the money with more than 2,100 players returning to the tables on Thursday. With a prize pool of more than $63 million, first place will earn an even $8 million this year! All nine players at the final table are guaranteed at least $1 million. Thursday’s Day 3 will see all the surviving players in this prestigious $10,000 tournament combining into a single field for the first time. Action will get started at noon with the second half of Level 11 and will continue through part of Level 16 before those remaining will bag chips at about 1 a.m. for Day 4 on Friday.